Delhi. 06th November 2018: Adding to the series of initiatives on the run up to the National Ayurveda Day, which will be celebrated on November 5th, the All India Institute of Ayurveda under the aegis of Ministry of AYUSH conducted a first ever national level Ayurveda Quiz competition. The initiative which was also supported by Multani Pharmaceuticals aimed to foster the growing awareness of Ayurveda in curing ailments and to encourage students to upgrade their efficiency in domains of Ayurveda from Classical texts to Contemporary Research. The finals of the fiercely contested quiz competition were graced by Padmashree Vaidya Rajesh Kotecha, Secretary, Ministry of AYUSH, Govt. of India, along with Prof. Dr. Tanuja Manoj Nesari, Director, AIIA and with other dignitaries from Ministry of AYUSH who came forward to support the contestants. “In observance of the Ayurveda Day 2018, a series of events had been entrusted to AIIA by Ministry of AYUSH, with the Theme “Role of Ayurveda in Public Health.” The National Level Quiz competition has witnessed the participation of 33 institutes of Ayurveda from 4 zones and 24 states. The competition had successfully completed the zonal levels on 24th October from which 8 teams, 16 bright, young minds in Ayurveda research, qualified for the national level. This is the first such initiative to promote Ayurveda at an academic level at such a large scale. We will be taking these efforts forward next year and reach out to every state in the country.”, said Prof. Dr. Tanuja Manoj Nesari, Director, AIIA. “Recognition helps in building confidence and striving for recognition fosters competence. We are happy to support initiatives conceptualized by the Ministry of AYUSH and AIIA to promote Ayurveda all over the world where it is gaining much traction. A number of modern day health challenges can naturally be treated by Ayurvedic practices, but until recently India couldn’t give the desired focus owing to modern obsession towards western medical sciences.” said Mr. Pradeep Multani, Chairman, Multani Pharmaceuticals Ltd. The institutes that qualified for the finals included, Pt. Khushilal Sharma Govt. Ayu. College & Institute, Bhopal and Smt K.G. Mittal Ayurveda College, Mumbai from West Zone; Gopabandhu Ayurveda Mahavidyalaya, Puri, Orissa and Govt. Ayurvedic Medical College & Hospital, Patna, Bihar from East Zone; All India Institute of Ayurveda, New Delhi and A&U Tibbia College, Delhi, from North Zone; and Govt Ayurvedic Medical College, Bengaluru and Atreya Ayurvedic Medical College, Doddaballapur, Banglore. 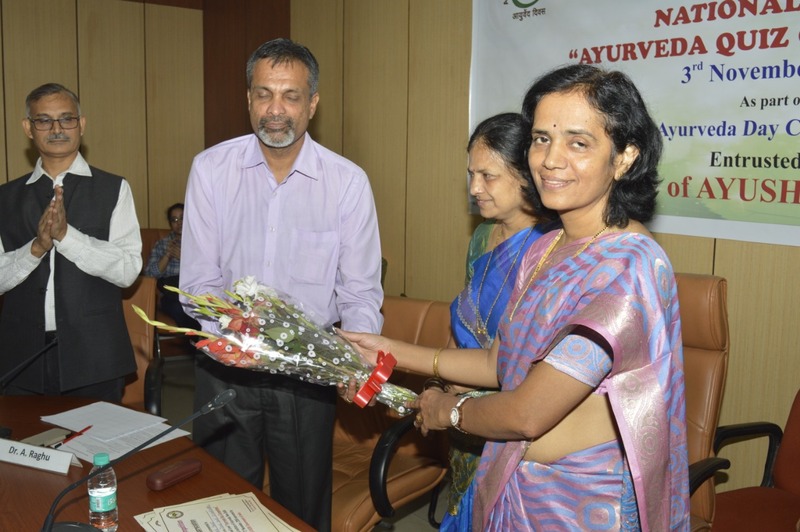 In the earlier events, under the Ministry of AYUSH directives, AIIA supported by Multani Pharmaceuticals, organized a two-day training program for women professionals of AYUSH Institutes on 30th & 31st October, 2018, to enhance managerial and leadership skills in women professionals working in different sectors of Ayurveda, thus to build a proficient women professionals in the field of Ayurveda. Also, around 3000 people participants in the first ever “Run for Ayurveda” initiative organized by the AIIA on October 28th which saw many AYUSH and government bodies participating. The event also included a walkathon and yoga performances. The winners of “Run for Ayurveda” received the trophies, medals and cash prizes from Minister of State (IC), Ministry of AYUSH, Shri Shripad Yesso Naik himself. Also, continuing from last year when Ministry of AYUSH had organized a seminar on “Increasing Ayurveda market share three fold by year 2022” on the occasion of 2nd Ayurveda Day, this year “National Seminar on Entrepreneurship and Business Development in Ayurveda” is being organized on 4th Nov. 2018 at Ambedkar International Center, Janpath, New Delhi, with the intention to encourage entrepreneurs and Ayurveda stakeholders towards businesses opportunities in Ayurveda sector.